WASHINGTON? NASA intends to make multiple year-longspace act agreement awards to firms seeking to mature technologies insupportof U.S. President Barack Obama's commercial space transportationinitiative byspring of next year, the agency announced Oct. 1. NASAstarted the CommercialCrew Development(CCDev) program in 2009 with $50 million ineconomic recovery funds. 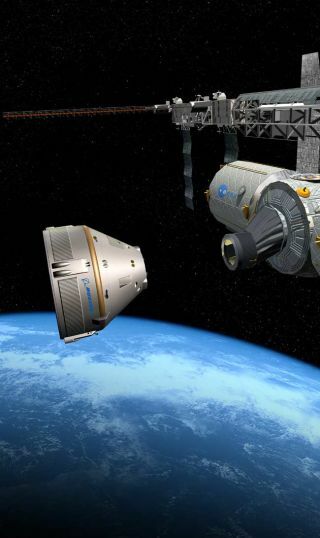 The project led to five contract awards to newandestablished aerospace firms who are currently using the seed money tomaturecapabilities in support of a commercial crew transportation system. DubbedCommercial Crew Development Round 2, the newawards will comprise a set of follow-on efforts to the existing CCDevinitiative to "further advance commercialcrew space transportationsystem concepts and mature the designand development of elements of the system such as launch vehicles andspacecraft," the document states. Theagency expects to issue a formal announcement callingfor CCDev 2 proposals by Oct. 25, according to the document, withresponses due45 days later and a final selection of multiple award winners plannedfor March2011. NASAplans to use its so-called "othertransactions" authority under the NationalAeronautics and Space Actto invest in multiple, competitivelyawarded agreements, though funding for the effort will depend on levelsprovided in pending 2011 U.S. federal spending legislation expectedlater thisyear. Theagreements are expected to lead to "significantmaturation of commercialcrew systemswith consideration given to NASA?s drafthuman certification requirements and standards or industry equivalentto thoserequirements and standards," the announcement said. NASA plans toconducta preproposal conference within two weeks of its forthcoming release todiscussthe CCDev 2 activity and answer questions, the document states.